You’re getting older. I know you don’t like hearing it, but the fact is that we’re all trapped in the clutches of Mother Time and she isn’t letting go. What we have to remember though is that growing older doesn’t make you ancient; it makes you human. Nobody enters their 50th year to find their clothes no longer fit or that stairs have become impassable overnight. You do need to take steps to maintain your health in the long run, however, and there are a few inescapable factors we have to deal with. Our metabolism slows down over time. Maintaining the same exercise-to-diet ratio that you did ten years ago will make your clothes a little tighter around the waist than you’d expect. In light of this, might it be time for a change? Our hormones are responsible for many of our youth-like qualities. One unfortunate price we pay for our growth in wisdom and responsibility is that their production falters. There’s nothing we can do to increase it, but by using our behaviour to boost our health and wellbeing, we can counterbalance its effects. Hopefully, you took mother’s advice and drank plenty of milk as a youngster and were rewarded with healthy, strong bones. Sadly, these also deteriorate with age as they lose calcium and other minerals making them both more soft and weak. While we don’t mean to make ageing sound quite so daunting, it is important we consider our own mortality now and again. Fortunately for us all, each of these age-based nuisances can be countered with the right mindset. Take control of your body by exercising and reclaiming your youth. Fauja Singh epitomised this by being the oldest man ever to run a marathon, at 101 years old. Before you panic, we aren’t asking you to run 26 miles, swim across the sea or climb Everest; do whatever exercise you can, within your daily schedule, to provide your brain with fresh, oxygenated blood. Get to know the local park by walking there a few days a week. If you’re desk bound (which sadly the majority of us are) then why not take a few calls on your feet or take a stroll to a nearby shop instead of the canteen for lunch? Gym work and intense cardio are great for the body, but what we’re really advocating is that need to energise your body every single day in smaller ways. They say sitting is the new smoking, and we’re all getting steadily addicted. Break the mould and start activating today: reignite your metabolism, build stronger muscles and boost your brain power. Don’t worry about the extra candles on your birthday cake – if you’re active and in control, you can probably even afford an extra slice this year! Our habitual thoughts, way of being and ‘lens’ on the world that determines how we react or respond to situations and hence our experiences in and of the world. For example if you are the worrying type, you may over-plan, are probably afraid of changes, and unlikely to disrupt your daily routine with a spontaneous activity. We need to stop, take time to think of our inner world: our thoughts, our attitude, our complex emotions that drive our various ways of interacting with others. Are you aware that there is a second layer to your “inner world”, your “third world”? This is our true inner, deeper self and our inner life. This third world truly speaks to us as when we are in silence; when we are meditating or when we are being present and mindful such as when in deep prayer. In the mad rush of life, this is the part of the inner world that is often neglected. The part that absolutely needs to be remembered in order to address the barrage of demands and onslaught from the outer world. How do we access this “third world”? The simple answer is to develop the ability to be “in the moment”, to be present and to be mindful. This seems like another thing on our To Do List: which, in an overwhelmingly busy life … is anathema to most of us. Many of us feel like we are already tail-spinning through life. In my next blog, I will suggest ways in which you can take care of you inner world. No-one disputes the advantages of living in the right city, the right suburb, even the right street – this will result in a better return when you sell the house. But if you think your physical address is important, consider the importance of your mental address. A good physical address is worthwhile, but it’s not going to help you achieve anything in life. There’s another address you need to make sure is a good address – this one will either help you achieve more with your life, or will be a stumbling block to any dreams and ambitions you may have. This address will in all probability determine your physical address of a few years’ time. Where you live mentally will determine your physical address in the future. Where are you staying in your mind? Is your mental address in a run-down neighbourhood, littered with junk and in a state of general decay? Or is it in a really great place – well maintained, pleasant, attractive, and a really good place to be? No-one else but you determines your mental address. You might blame your boss, your partner, your family circumstances, your background and a host of other people and things for your physical address, but you can blame nobody for where you’re staying mentally. That’s an address only you choose. Your mental address is determined by your attitude to life and to the circumstances you face. Life comprises a blend of pain and pleasure. Those who expect only pleasure out of life set themselves up for frustration, disappointment and possibly depression. No-one, no matter who they are, can avoid having to deal with pain of some sort in their lives. So don’t be angry when you encounter pain, physical or emotional. Realise that it’s an opportunity to grow yourself into somebody bigger than who you currently are. While this may sound like cold comfort, I can assure you, based on hindsight, that I can now see the benefits of times when I experienced pain. I am now consciously thankful for what I went through because of what I learnt as a result. Whether it is personal pain in the form of relationships, health, finance, personal emotions or professional pain in the workplace, don’t try to ignore or avoid it. Face it head on, do what is necessary to overcome the circumstances. Allowing things to get out of hand and by living in denial gives the pain opportunity to increase its power over you. When you turn and face the pain, you start a process that helps you clean up your mental neighbourhood. Tidying up your mind is the first step to tidying up your life. So start looking to change your address so you can live at a much better mental address. And, in the process of moving house, do a spring clean also. Clean out the junk at your current mental address and start preparing right now for a better future for yourself, your career and your company. Let’s face it, Mediterranean Europeans are the apple of many of our eyes; from the glowing, clear skin to the chestnut eyes and bright white teeth, these hardworking and joyful people are often admired from afar in their seemingly utopian lifestyle. Something which has definitely struck me from my time in the South of France is the influence of diet on people’s vitality and happiness. We’re all guilty of slipping off the “good food” wagon now and again. Picking double pepperoni over the vegetable medley is fine, and no one is pretending that the romans don’t get sore heads from having one too many flagons of wine, but there is actually an huge amount to be gained from living a more Mediterranean diet. What are the obvious ingredients to a “healthy” diet? Vegetables – check; freshness – check; natural – check. That’s the bones of eating in the Mediterranean style. It’s not about loaves of bread as big as the dog; it’s about balance and using carbs like pasta or bread as an accompaniment, not the main body of a meal. To give you an idea, an average meal might be like this. Snacks: a small handful of nuts, fruit, yoghurt, cheese or olives. Suddenly it’s not so complicated, right? There’s a stigma which says this diet is too expensive or complicated to be achievable, but if millions of people do it naturally, it’s probably not all that difficult. The best part is that so much of this diet is right out the ground or off the tree; if you are fortunate enough to have a large garden or a small plot of land, then put it to good use and grow your favourite vegetables. If not, the supermarket will supply everything listed above and the cost is comparable to convenience foods. Another boon of the Mediterranean lifestyle is the use of fresh herbs. Salt and pepper are the wooden spoons of seasoning: useful, but limited. Fresh garden herbs are the Swiss army knife: varied, exciting and always the solution to creating a flavoursome meal. When it comes down to it, a Mediterranean diet is quite easy, but you will want to ease yourself in. Try going vegetarian one night a week, or experimenting with different types of fish. Try hummus with lunch at work over a chocolate bar. With time, it’ll feel natural and your body, as well as your mind, will thank you for it. I recently presented pre-retirement workshops to SA Breweries employees of fifty-five years and older. Following the presentation, a number of participants shared that they understood for the first time the need to retire to something, rather than leaving a fulfilling future to chance. I explain that their personal retirement financial plans can be built around their lives, dreams and aspirations, rather than being just a set of numbers. Including their goals and dreams in the financial equation will ensure that they achieve more meaning and purpose – in other words, retire successfully. In the presentation, I use the Wheel of Balance as a tool to explain the concept of retiring to something. One element of this Wheel is Health, and in this context, I often cite Retire Successfully’s retirementor, Dr Wayne Derman. At a recent Chartered seminar, he said something simple, yet profound and powerful. He pointed out that, in the 21st century, people are generally living far longer than previous generations. Sadly, though, quality of life does not automatically come with this longer lifespan. This is because we risk suffering from degenerative illnesses that undermine the quality of that longevity. Ideally, he said, we should maintain the quality of our health at retirement for as long as possible, rather than experiencing a steady decline over time as our bodies deteriorate. According to Wayne, if there is one “magic pill” above all others that will help people retain their health levels longer, it is this: EXERCISE. Many people, especially those who have not been physically active during their lives, interpret “exercise” as becoming so exhausted that they cannot speak and constantly having tired, aching bodies. This is definitely not the case. The body needs regular, gentle exercise to bring out all the endorphins needed to live longer and healthier lives. Exercise can be started at any age or stage of life, provided that a person gets a medical check beforehand. Exercise can involve strong walking, slow jogging, even swimming or cycling, basically any exercise that gets the heart rate raised for a period of time. To have a positive long-term effect, proper exercise should be done about five times a week for an average of twenty minutes each time. I know from personal experience that our busy lives often exclude exercise-time and I am often tempted to skip a session. But I know that my “magic pill” will not work so effectively then. Ensuring that our bodies get what they need means that we have to make exercise a priority. That time that we set aside to exercise must become non-negotiable. The key word here is routine. Make sure that time is booked every week for exercise. It has to become a habit, one which will become more enjoyable and rewarding as time passes. Then you will also see that it really is a ‘magic pill’. Click here to read the rest of the October issue of Inlfight. STOP Sugar … Kick the Habit! Lindajane and Trevor Thompson are outdoor people. Lean and fit, this retired couple from Belvedere near Knysna epitomises what it means to enjoy the outdoors actively, right into your sixties and beyond. “When we retired in 2007, we decided to keep active as a lifestyle choice. Nine years later, we are still going as strongly as ever,” explains Trevor, the former co-owner of a successful transport and removal company. One of their favourite activities is slack-packing. Sounds easy? Forget it. Slack-packing is challenging. “Depending on the trip, you can walk over mountains, on trails, along beaches and even wade through rivers. You need to be fit as the group moves at a steady pace, no matter what the terrain is,” emphasises Trevor. The Thompsons have slack-packed all over the country. 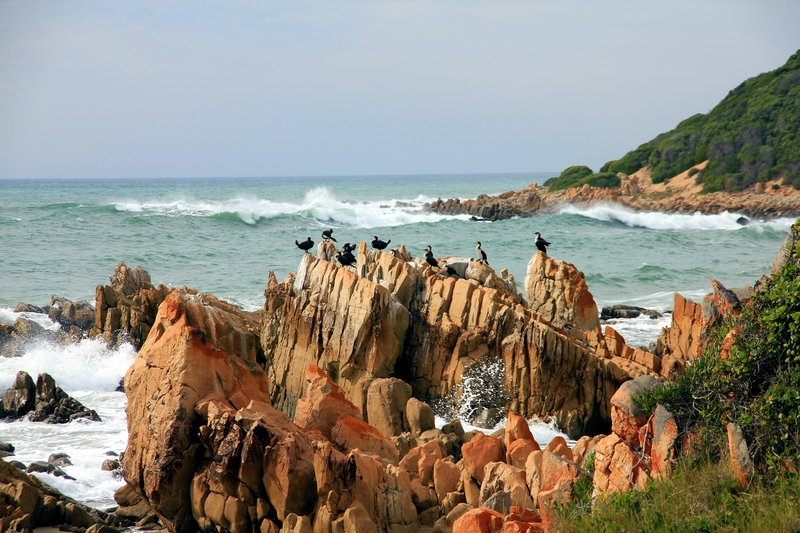 “One of our favourite trips was the Oystercatcher Trail from Mossel Bay to Gouritzmond. It was along the coast and each day’s hiking was different. We went from cliff tops and sea front caves to unspoiled beaches, rocky bays and massive sand dunes. Each night was spent in a different bed and breakfast. We had dinner in the evenings and carried a packed lunch for our daytime meal. You certainly needed it with all that walking,” says Lindajane. The Thompsons are not alone in praising the Oystercatcher Trail. Getaway Magazine rated it as one of the top five hiking trails in South Africa while in 2007 and 2008 National Geographic considered it “one of the top fifty tours of a lifetime”. High praise indeed. Lindajane and Trevor undertake several walks each year. “Our next one is in October when we’ll be doing the Hermanus to Pringle Bay walk. This is along another beautiful coastline at that time of the year when whale-watching is at its best. We have heard that this is one of the areas where abalone catching is very popular. Of course, this can be legal or illegal and apparently abalone poachers have methods that have to be seen to be believed,” said Trevor, laughing. A love of the outdoors, a spirit of adventure, basic fitness and a good pair of hiking boots is all that is needed to enjoy slack-packing. And Lindajane and Trevor Thompson of Knysna have all of these in abundance. We look forward to hearing all about those colourful poachers.